Risperdal is an atypical anti-psychotic medication approved to treat symptoms of schizophrenia, bipolar disorder, and autism. Risperdal and other atypical antipsychotics are designed to target the brain’s serotonin and dopamine receptors. In addition to being prescribed for the treatment of schizophrenia and bipolar disorder in adults and adolescents, Risperdal is also approved for the treatment of irritability in pediatric patients—children 5-16 years of age—who are diagnosed with autistic disorder. Risperdal is also used off-label to treat attention deficit hyperactivity disorder (ADHD). Risperdal received U.S. Food and Drug Administration approval in 1993, but the drug was not cleared for any pediatric uses until 2006. Unfortunately, thousands of doctors have prescribed Risperdal for unapproved uses, with serious consequences. The use of Risperdal has been linked to a condition called gynecomastia, or the enlargement of male breast tissue. 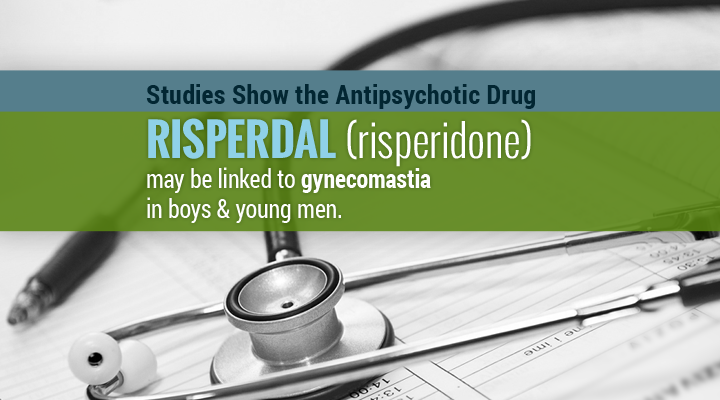 This condition has been seen in young boys and men who have used Risperdal. Various studies have revealed an association between the use of Risperdal and gynecomastia. In 2006, one study published in the Journal of Clinical Psychopharmacology revealed that some children who took Risperdal developed elevated prolactin levels. Prolactin is a hormone associated with the development of breasts in girls as well as lactation in new mothers. Another study, published in 2009 in the Journal of Child and Adolescent Psychopharmacology, revealed that the increased prolactin levels seen in Risperdal patients could continue for up to two years. Mounting Risperdal claims have been filed nationwide over allegations that Johnson & Johnson and its Janssen unit knew that taking Risperdal could lead to gynecomastia, yet concealed that knowledge from the public. In October 2012, Bloomberg News reported the drug makers began settling some lawsuits pending in a consolidated litigation that was underway in the Philadelphia Court of Common Pleas in Pennsylvania. At that time, five settlements were reached on behalf of boys who allegedly developed gynecomastia due to Risperdal. In November 2012, Johnson & Johnson and Janssen agreed to pay $2.2 billion to settle criminal and civil charges with the federal government involving the marketing of Risperdal and other drugs. Among other things, the U.S. Department of Justice also charged that the drug maker illegally marketed Risperdal for children well before the drug was approved for use in pediatric patients. If you or someone you know has been adversely affected by Risperdal, contact us to learn more about your options for pursuing a Risperdal lawsuit at 1.888.725.1890.